This is a gardener’s favorite time of year. All is new green growth and hopeful expectation. Weeds, bugs, and wilting heat are yet to come. Snow and freezing temperatures seem more and more remote. Whether you are an armchair gardener or a gardener with dirt under your nails (I’m a little bit of both), here are three books for the season. 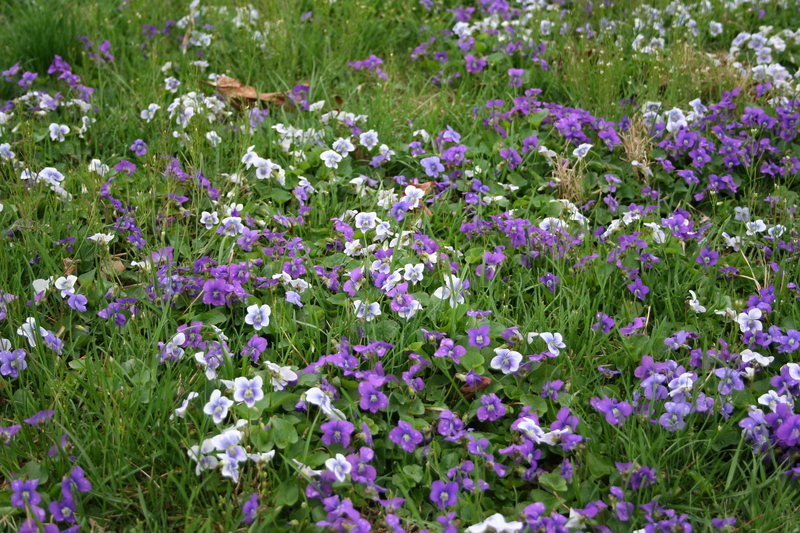 Wild violets in the yard here at Maplehurst. Gardening books are some of the favorites on my shelves. In the age of google you’d imagine the internet would be a gardener’s best resource. In my opinion, the internet is almost too helpful. It can be difficult to sort the good advice from the bad, and I rarely google a gardening question without ending up overwhelmed. A well-edited, common-sense garden reference book is so much better. My copy of The Garden Primer: Second Edition by Barbara Damrosch is creased and dirty. Like a good cookbook, this is a sign of its worth. When we planted apple trees, this book showed us how. When choosing blueberry varieties, I consulted this book. From roses to vegetables, from seed starting to planting bulbs, this book has just enough (and never too much) to say about almost everything that grows. I need to learn the name of these white-flowering shrubs. They are stunning. I bought The Tree Book for Kids and Their Grown Ups by Gina Ingoglia for my children. They’ve enjoyed it, but I know I’ve opened it up more than they have. The watercolor illustrations are beautiful and informative. Yes, we could always turn to google images, but it is so much more satisfying to take this book along for a walk, identifying leaves and bark and fruit along the way. It’s one of my goals to know the names of all the trees growing here at Maplehurst. This book is a very nice way to start. Lawns without weeds or dandelions make me nervous. Our own lawn supports a healthy ecosystem of weeds. The title of Ruth Stout’s Gardening Without Work: For the Aging, the Busy & the Indolent pretty much speaks for itself. Originally published in 1961, this book by the folksy grand dame of American home gardening is funny, entertaining, and, occasionally, quite helpful. Stout’s advice can pretty much be summed up in one word: mulch. But, it’s a very good word. Ask me in a few years if mulching has really made vegetable gardening easier, however my broccoli seedlings do look very cozy in their mulched bed. 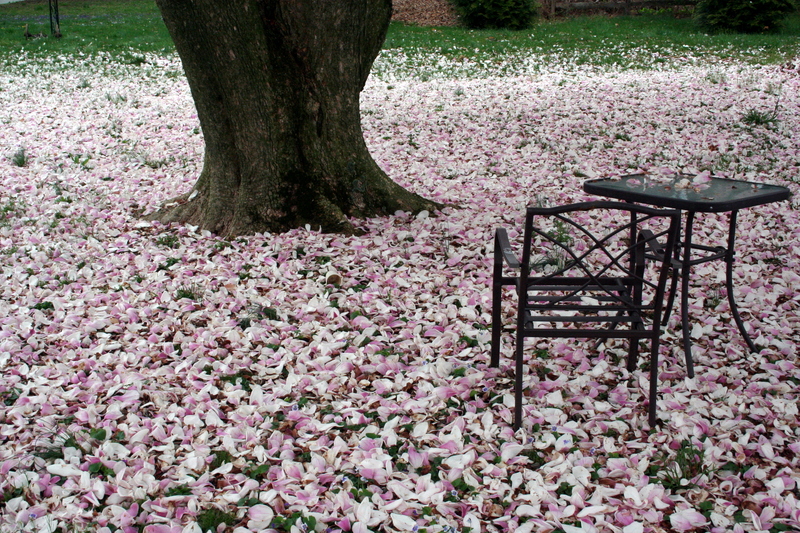 The magnolia blossoms are almost as beautiful after they’ve fallen. I was thinking of you and your gorgeous flowering tree this morning as I scraped SNOW off my car. The tulips I planted last fall have shown a few inches of their green stems, but I’m so anxious for their colorful flowers to burst forth. I’ve already planned to plant daffodils in our yard this fall, because they scream hopeful anticipation for more of their flowering, colorful friends to come in their snowy beds around the neighborhood. 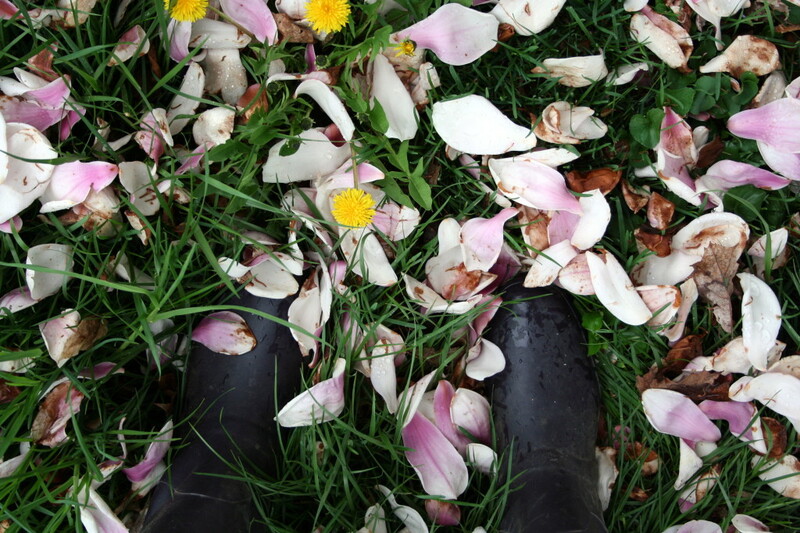 Thanks for allowing me a vicarious peak into spring from your Pennsylvania yard…pray it comes to Chicago soon! Oh, Aimee, SNOW!! I am so sorry, friend. Praying some of our warm, flower-scented springtime air heads your way. I inherited my mom’s the new square foot garden and really like it. Of course, my square foot window boxes never quite live up to my springtime dreams, but I don’t blame Mel for that. 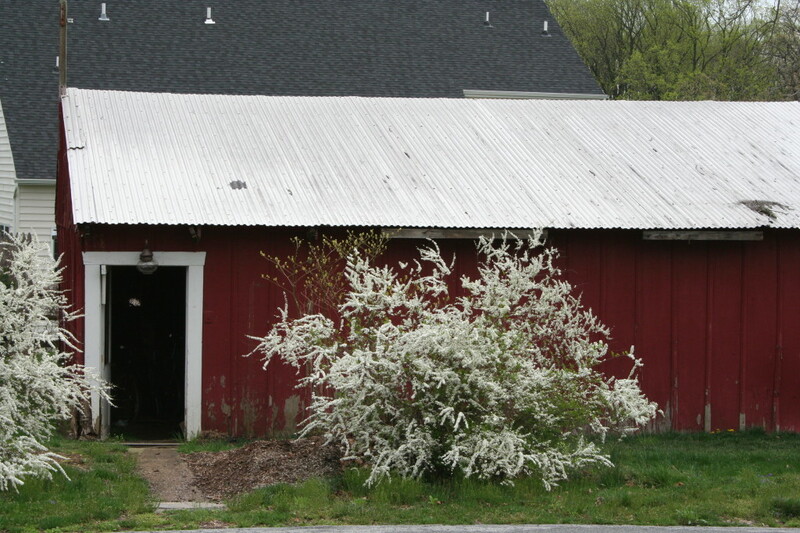 I believe those shrubs are bridal wreath spirea. Cuttings are pretty in bouquets with azaleas! I just dug all the soil out of my veggie bed and started over fresh and healthy. So maybe this, my last Florida summer, will be the one with plenty of tomatoes and cucumbers? Yes! I thought “bridal” was in the name. Thanks, Kelli. I have some of the branches in a vase on my fireplace mantel. I can’t believe how long they’re lasting. Gorgeous. You have a bounty of spring beauty at Maplehurst! Love the photos, they made me sigh. I enjoy gardening, although I’m not what one would call a bonafide gardener. This year besides veggies, herbs, and annuals for color, I planted a fig tree. I love figs, and I’m hoping to harvest some. One of my favorite childhood memories is of the fig tree we had in our yard. I didn’t know how lucky I was to be able to step outside and eat fresh, sun-warmed figs. Thank you, Carla! So glad you found me. A Colorado friend just posted a photo of her snowy front yard. I do love snow, but I imagine that’s hard to take this late in April. I hope spring finds its way to you soon. Today was the first day of 70degree weather here in Sioux Falls! It’s been snowing up until a few days ago. Longest.winter.ever. I long to garden. I live in an apartment, and even though there are pots and whatnot to make gardening a reality in small spaces, I just want to kneel and sink my knees into the earth and prick my fingers on the weeds and get sunburned from being out in my garden for too long…We hope to have a house by the spring of next year. I’m dreaming!!! Beautiful beautiful photographs and writing. I’m so glad I found you!